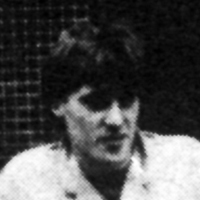 David Henderson was always credited with “Sounds And Ideas”, an illusive sixth-member (along with his sister Jaine), whose influence extended to even being included in promotional shots of the band, but who never actually got on stage. Including his duties on the soundboard for the fledgling Minds, he acted in a managerial role with Jim, hussling for gigs and coming up with ideas. He joined Jim when they first visited Bruce Findlay, to ask the record store and label boss for advice when they visited Edinburgh. By Life In A Day, David was the band's full time sound engineer, a role he repeated for part of the Real To Real Cacophony tour. After a public argument with roadcrew chief Billy Worton (who was an experienced sound engineer himself), he wasn't assertive or aggressive enough to defend his position. The band felt this non-passionate display was due to him loosing faith in them, and David left the band after they returned to the UK. He returned to Glasgow where he managed several bands and the recording and rehearsal studio called The Hellfire Club.